Mitsubishi’s wind/unwind inverter provides control technology for continuous roll-to-roll applications. It is for the processing of a web (sheet of a paper, film, or other material) from the unwinding roll to the winding roll. Moreover, it features stable winding and unwinding performance, and ease of start-up and adjustment. The FR-A800-R2R is a dedicated roll-to-roll drive offering dedicated functions. It includes automatic winding diameter calculations, automatic dancer speed control, and sensorless torque control. It performs fast, smooth, and accurate winding/unwinding applications with precise tension feedback. Thus delivering stable and precise control in VSD wind/unwind applications. These complex functions do not need additional sequence or motion control programming. The FR-A800-R2R inverter’s built-in PLC eliminates the need for a separate controller. It offers easy-to-use parameterisation to set and enhance functions. 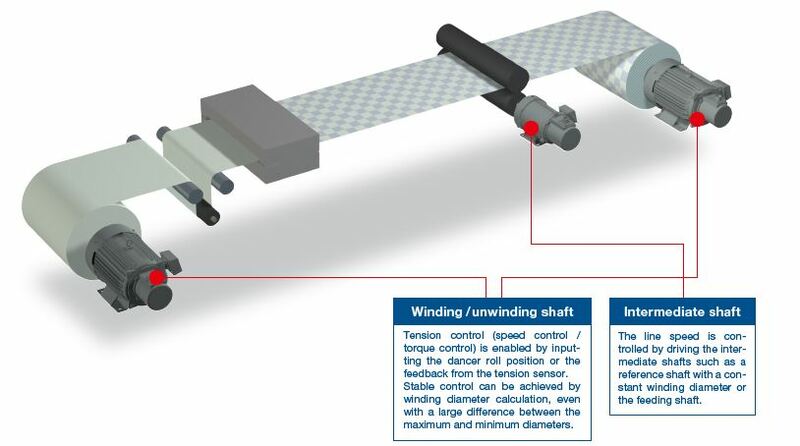 Markedly, it enable users without advanced tension control knowledge to control winding/unwinding applications. Controlling speed and torque allow changes in the diameter of the winding and unwinding shafts during operation. The present winding diameter of the winding unwinding shaft derives from the actual line speed or the actual motor speed to ensure quick and easy system setup. Torque required for acceleration/deceleration and the mechanical loss compensation torque are controlled. As a result, they keep material tension constant and reduces wrinkling or deformations within the roll. PID control utilises the feedback from the detected dancer roll position or feedback from the tension sensor. Stable control derives in combination with the winding diameter calculation. What’s more, adjusting the speed control proportional gain relative to winding diameter response remains constant.